It didn’t take Van Morrison long to drop the ethereal trappings of his first monumental masterpiece Astral Weeks and propel himself back into the more muscular sounds of his earlier efforts with Them, the Belfast-brewed band that thrust him into prominence with such venerable gems as “Gloria” and “Here Comes the Night.” The change occurred gradually, beginning with the popular appeal of Moondance and continuing through the rustic realms of His Band and the Street Choir and Tupelo Honey, before eventually culminating with the mid-‘70s sounds of Saint Dominic’s Preview and Hard Nose the Highway. However, that progression was accelerated even further with his epic landmark double live album, It’s Too Late To Stop Now, released in January 1974. A collection of concert performances recorded the prior year, it effectively encapsulated his career up to that point. Decidedly more emphatic than anything he had produced previously, it revealed him to be a live performer who was confident, compelling and thoroughly in command of his craft. 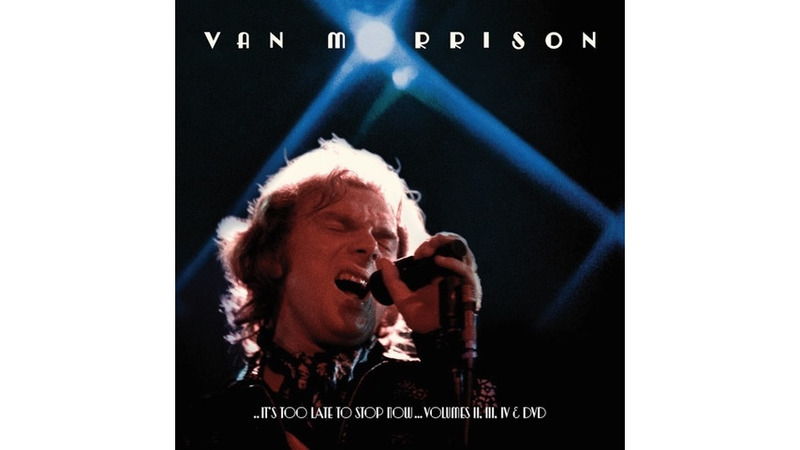 The original 2008 reissue of It’s Too Late To Stop Now expanded the initial offering with remastered sound, enhanced packaging and a single bonus track in the form of “Brown Eyed Girl.” This sequel of sorts, spread across three additional discs and a spectacular hour-long DVD, adds three hours of audio culled from the same concerts that birthed the original album. Suffice it to say, a number of new songs show up in the mix, many of them from the studio releases that immediately preceded these shows. As expected however, there is quite a bit of repetition in the set list—multiple versions of “Caravan,” “Domino” and “Brown Eyed Girl” to name but a few. Still, Morrison’s knack for varying his phrasing and giving way to spontaneous expression moot any sense that this is merely more of the same. Indeed, the fact that he tosses in some compatible covers—a riveting version of “I Just Want To Make Love To You,” a credible take on the Hank Williams chestnut “Hey Good Lookin’” and two extraordinarily soulful reads of “Since I Fell For You”—underscores his verve and tenacity. Those who were weened on the original album will find this follow-up a necessary acquisition. And for those who somehow missed it the first time, or were born too late to even be aware, these further volumes of It’s Too Late To Stop Now prove it’s never too late, especially when reconnecting with genius.